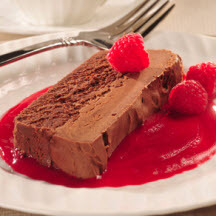 This elegant dessert is a hazelnut and chocolate-lover's dream served in a puddle of ruby-red raspberry sauce. Line a 9x5x3-inch loaf pan with plastic wrap. For Dark Chocolate Layer: Microwave semi-sweet morsels and 1/3 cup butter in a medium, microwave-safe bowl on HIGH (100%) power for 1 minute; stir. Microwave at additional 10 to 20-second intervals, stirring until smooth. Stir in liqueur; cool to room temperature. Whip cream in a small mixing bowl until stiff peaks form. Fold 2 cups whipped cream into chocolate mixture. Spoon into prepared loaf pan. Refrigerate remaining whipped cream. For Milk Chocolate Layer: Microwave milk chocolate morsels and 1/3 cup butter in a medium, microwave-safe bowl on MEDIUM-HIGH (70%) power for 1 minute; stir. Microwave at additional 10 to 20-second intervals, stirring until smooth. Cool to room temperature. Stir remaining whipped cream into chocolate mixture. Spread over dark chocolate layer. Cover; refrigerate for at least 2 hours or until firm. For Raspberry Sauce: Cook raspberry purée, water, cornstarch and sugar over medium heat, stirring constantly, until mixture comes to a boil; boil for 1 minute. Cover; refrigerate. To Serve: Invert terrine onto serving platter; remove plastic wrap. Cut into 1/2-inch thick slices; serve in a puddle of Raspberry Sauce. Nutritional Information Per Serving (1/16 of recipe): Calories: 400 Calories from Fat: 260 Total Fat: 28 g Saturated Fat: 17 g Cholesterol: 55 mg Sodium: 65 mg Carbohydrates: 35 g Dietary Fiber: 2 g Sugars: 29 g Protein: 2 g.